To cure you of your syphilis. Crabs-riddled beatnik snaps for your fresh lyrics. 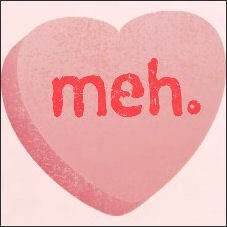 I'm not single, but I'm not a huge fan of Valentine's Day either..
Definitely not a coincidence. Ask the Illuminati. Did you check I give you a butterfly blogger award ? @G my birthday is the 2nd week of November, and that just blew my freaking mind. Oh, and as a married guy, I have no need for condoms, pregnancy tests, OR syphilis! Score! SO glad to have survived another relationship-free VD! …wait, that sounds bad. …but I can't bring myself to spell out the actually holiday. izdiher: yes! thank you, I will probably make a post about that soon! Red: Yea it is a tough one to spell out if you are bitter.